This is a Japanese name; the family name is Noguchi. Hideyo Noguchi (野口 英世 or Noguchi Hideyo) (November 24, 1876 – May 21, 1928), also known as Noguchi Seisaku, was a prominent Japanese bacteriologist who discovered the agent for syphilis, in 1911. Noguchi was born into poverty and became handicapped when, at the age of one, he severely burned his left hand. 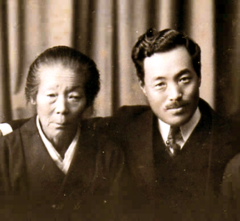 Noguchi rose above his situation and with the help of his mother and teachers became a medical doctor. In 1900, he came to the U.S. and worked at the University of Pennsylvania, and later at the Rockefeller Institute of Medical Research. Noguchi traveled extensively in Central America and South America to do research for a vaccine for yellow fever and to research Oroya fever, poliomyelitis and trachoma. In 1928, he traveled to Africa to confirm his findings. Noguchi, however, was infected with yellow fever and died in the same year. Noguchi received a number of awards during his lifetime and after his death. The Japanese government established the Hideyo Noguchi African Prize in 2006 and the award has been given every five years to individuals who made notable medical contributions in Africa. Noguchi Hideyo was born as the eldest son of Sayosuke Noguchi (野口佐代助) (father) and Shika (mother), in Inawashiro, Fukushima prefecture on November 9, 1876. His youth name is Seisaku (清作). The Noguchi family were poor peasants for generations. When he was one and a half years old he fell into a fireplace and suffered a burn injury on his left hand. There was no doctor in the small village, but one of the men examined the boy. "The fingers of the left hand are mostly gone," he said, "and the left arm and the left foot and the right hand are burned; I know not how badly." Due to the injury to his left hand, he could not expect to become a peasant. Shika, Noguchi's mother, had strong faith in Kwannon Buddhism. It is said that she prayed day and night to ask Buddha to save her son. While she continued to pray, she became determined to give her son an education so that he can find his way in spite of his physical handicap. For Noguchi's family as a poor peasant, it looked impossible to send him to school. Shika did additional physical labor to raise extra funds. Sakae Kobayashi (小林栄), a teacher at the Inawashiro elementary school, financially supported the family, which made it possible for Noguchi to enter the elementary school in 1889. He was smart and teachers soon recognized his abilities. Thanks to generous contributions from his teacher Kobayashi and his friends, he was able to receive surgery, from Kanae Watanabe, on his badly burned left hand and he recovered about 70 percent mobility and functionality. Noguchi decided to become a doctor to help those in need. He often cited the words, "Napoleon did not sleep more than three hours" and practiced it to save time for studies. When he left his hometown for Tokyo to study medical science, he left with the words, "I will never set foot on the soil of my hometown until I accomplish my will." He apprenticed himself to Dr. Kanae Watanabe (渡部鼎, Watanabe Kanae), the same doctor who had performed the surgery on his hand. He passed the examinations to practice medicine when he was twenty years old in 1896. He showed signs of great talent and was supported in his studies by Dr. Morinosuke Chiwaki. In 1898, he changed his first name to Hideyo after reading a fictional novel about a man who had the similar name—Nonoguchi Seisaku (野々口精作)—as him. The character in the novel was intelligent like Noguchi, but became lazy and ruined his life. Noguchi found the similar shortcomings in the character of the novel and changed his name from Seisaku to Hideyo (英世) to make a new start of life. In 1898, Noguchi became an assistant to Shibasaburo Kitazato at his research institute of infectious disease. He met Dr. Simon Flexner at the institute. 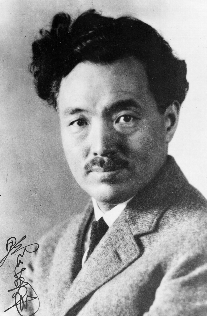 Due to his excellent work, Noguchi was dispatched to China as a member of international pest prevention committee. In 1900 Noguchi moved to the United States, where he obtained a job as a research assistant with Dr. Simon Flexner at the University of Pennsylvania and later at the Rockefeller Institute of Medical Research. He thrived in this environment. At this time his work concerned poisonous snakes. In part, his move was motivated by difficulties in obtaining a medical position in Japan, as prospective employers were concerned about the impact the hand deformity would have on potential patients. In a research setting, this handicap became a non-issue. He and his peers learned from their work and from each other. In this period, a fellow research assistant in Flexner's lab was Frenchman Alexis Carrel, who would go on to win a Nobel Prize in 1912; and Noguchi's work would later attract the Prize committee's scrutiny. The Nobel Foundation archives have been only recently opened for public inspection; and what was once only speculation is now confirmed. He was nominated in 1913, 1914, 1915, 1920, 1921, 1924, 1925, 1926, and 1927. While working at the Rockefeller Institute of Medical Research in 1913, he demonstrated the presence of Treponema pallidum (syphilitic spirochete) in the brain of a progressive paralysis patient, proving that the spirochete was the cause of the disease. Dr. Noguchi's name is remembered in the binomial attached to another spirochete, Leptospira noguchii. Noguchi worked so tirelessly, fellow researchers whispered, "when do the Japanese sleep?" In 1918, Noguchi traveled extensively in Central America and South America to do research for a vaccine for yellow fever, and to research Oroya fever, poliomyelitis and trachoma. While in Ecuador, he received a commission as a colonel in the Ecuadoran Army. In 1928, Noguchi traveled to Africa to confirm his findings. The purpose of this field work was to test the hypothesis that yellow fever was caused by spirochaete bacteria instead of a virus. While working in Accra, Gold Coast (modern-day Ghana) he was struck down by the yellow fever virus, his last words being, "I don't understand." 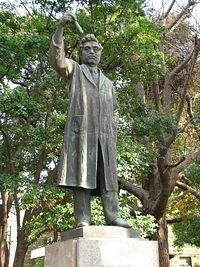 Statue of Hideyo Noguchi in Ueno Park. Noguchi was honored with both Japanese and foreign decorations. He received honorary degrees from a number of universities. He was discretely self-effacing in his public life, and he often referred to himself with naive objectiveness, as "funny Noguchi;" but those who knew him well reported that he "gloated in honors." When Noguchi was awarded an honorary doctorate at Yale, William Lyon Phelps observed that the Kings of Spain, Denmark and Sweden had conferred awards, but "perhaps he appreciates even more than royal honors the admiration and the gratitude of the people." Kyoto Imperial University—Doctor of Medicine, 1909. Order of Dannebrog, 1913 (Denmark). Order of Isabella the Catholic, 1913 (Spain). Order of the Polar Star, 1914 (Sweden). Tokyo Imperial University—Doctor of Science, 1914. Order of the Rising Sun, 4th class—1915. Imperial Award, Imperial Academy (Japan)—1915. In 1928, the Japanese government awarded Noguchi the Order of the Rising Sun second class. In 1979, the Noguchi Memorial Institute of Medical Research (NMIMR) was founded with funds donated by the Japanese government. The Institute is located at the University of Ghana in Legon, a suburb north of Accra. After his death, Noguchi's body was returned to the United States; but the mere existence of the NMIMR is arguably a more fitting memorial than the modest marker in New York City's Woodlawn Cemetery. Dr. Noguchi's portrait has been printed on Japanese 1000 yen banknotes since 2004. In addition, the house where he was born and raised is preserved and is part of a museum to his life and its achievements. The Japanese Government established the Hideyo Noguchi Africa Prize in July 2006 as a new international medical research and services award to mark the official visit of Prime Minister Junichiro Koizumi to Africa in May 2006 and the 80th anniversary of Dr. Noguchi’s death. The Prize aims to honor individuals with outstanding achievements in combating various infectious diseases in Africa or in establishing innovative medical service systems. The presentation ceremony and laureate lectures coincided with the Fourth Tokyo International Conference on African Development (TICAD) in late April 2008. In 2008, the conference venue was moved from Tokyo to Yokohama as another way of honoring the man after whom the prize was named. In 1899, Dr. Noguchi worked at the Yokohama Port Quarantine Office as an assistant quarantine doctor. The first awards of this international prize—consisting of a citation, a medal and an honorarium of 100 million yen (US$843,668) are only intended to be the first in a continuing series; and subsequently the Prize is expected to be awarded every five years. The prize as been made possible through a combination of government funding and private donations. 1904: The Action of Snake Venom Upon Cold-blooded Animals., Washington, D.C.: Carnegie Institution. Retrieved January 5, 2009. 1909: Snake Venoms: An Investigation of Venomous Snakes with Special Reference to the Phenomena of Their Venoms., Washington, D.C.: Carnegie Institution. Retrieved January 5, 2009. 1911: Serum Diagnosis of Syphilis and the Butyric Acid Test for Syphilis., Philadelphia: J. B. Lippincott. Retrieved January 5, 2009. 1923: Laboratory Diagnosis of Syphilis: A Manual for Students and Physicians., New York: P. B. Hoeber. Retrieved January 5, 2009. ↑ IFSA, Noguchi Hideyo (Japanese). Retrieved January 5, 2009. ↑ James Thomas Flexner, Maverick's Progress. Retrieved January 5, 2009. ↑ Christopher Gray, Streetscapes/Rockefeller University, 62nd to 68th Streets Along the East River; From a Child's Death Came a Medical Institute's Birth, New York Times. Retrieved January 5, 2009. ↑ Japanese Government Internet TV, "Hideyo Noguchi Africa Prize," streaming video 2007/04/26. Retrieved January 5, 2009. ↑ Bernard Dixon, "Fame, Failure, and Yellowjack," Microbe Magazine. Retrieved January 5, 2009. ↑ Aizuwakamatsu city official site, 野口英世年表 (Noguchi Hideyo choronology). Retrieved January 5, 2009. ↑ BBC/H2g2, Yellow Fever blurb. Retrieved January 5, 2009. ↑ Time, "Funny Noguchi." Retrieved January 5, 2009. ↑ 9.0 9.1 New York Times, Angll Inaugurated at Yale Graduation; New President Takes Office Before a Distinguished Audience of University Men;784 Degrees are given; Mme. Curie, Sir Robert Jones,Archibald Marshall, J.W. Davis and Others Honored. Retrieved January 5, 2009. ↑ Atsushi Kita, Dr. Noguchi's Journey: A Life of Medical Search and Discovery, 169. ↑ 13.0 13.1 Kita, 182. ↑ 15.0 15.1 Japan, Ministry of Foreign Affairs, Noguchi & Latin America. Retrieved January 5, 2009. ↑ University of Pennsylvania, Global Health Project. Retrieved January 5, 2009. ↑ University of Ghana, Noguchi Institute (NMIMR). Retrieved January 5, 2009. ↑ New York Times, A Place for All Eternity In Their Adopted Land. Retrieved January 5, 2009. ↑ Bank of Japan, Valid Bank of Japan Notes, as of August 2004. Retrieved January 5, 2009. ↑ Japan Science and Technology Agency, Comemorative Lecture: The First Hideyo Noguchi Africa Prize. Retrieved January 5, 2009. ↑ Rockefeller Foundation, Noguchi Prize, history. Retrieved January 5, 2009. ↑ Japan, Cabinet Office, Noguchi Prize, chronology. Retrieved January 5, 2009. ↑ Hideyo Noguchi Memorial Museum, Noguchi, life events. Retrieved January 5, 2009. ↑ World Health Organization, Noguchi Prize, WHO/AFRO involved. Retrieved January 5, 2009. ↑ Yomiuri Shimbun (Tokyo), Noguchi Africa Prize short by 70% of fund target. Retrieved January 5, 2009. Badaro, Roberto. "To Honor Hideyo Noguchi: 1876-1928." Brazilian Journal of Infectious Diseases. 2 (3): 164-8. Beard, Annie E.S. Our Foreign-Born Citizens. New York: Crowell, 1968. Clark, Paul F. Hideyo Noguchi, 1876-1928. 1959. D'Amelio, Dan, and Fred Banbery. Taller Than Bandai Mountain; The Story of Hideyo Noguchi. New York: Viking Press, 1968. Dixon, Bernard. "Fame, Failure, and Yellowjack." Microbe Magazine. Retrieved January 5, 2009. Eckstein, Gustav. Noguchi. New York: Harper & Brothers, 1931. Flexner, Simon. Hideyo Noguchi. Washington, D.C.: U.S. G.P.O., 1930. Hideyo Noguchi. Tokyo: The Doctor Noguchi Memorial Association, 1983. Kita, Atsushi. Dr. Noguchi's Journey: A Life of Medical Search and Discovery. Tokyo: Kodansha International, 2005. ISBN 9784770023551. Plesset, Isabel Rosanoff. Noguchi and His Patrons. Rutherford, NJ: Fairleigh Dickinson University Press, 1980. ISBN 9780838623473. Smith, Theobald, and William Henry Welch. Memorial Addresses: Hideyo Noguchi, 1876-1928. 1929. Tōkyō Shika Daigaku. Hideyo Noguchi His Life and Work. Tokyo: Tokyo Dental College, 1928. University of Cincinnati. Hideyo Noguchi Memorial Number. 1929. Watts G. "Hideyo Noguchi Africa Prize. Tightening the Net Around Malaria." BMJ (Clinical Research Ed.). 337. 2008. This page was last modified on 24 December 2017, at 20:11.